Smell that? That's the smell of roasted coffee beans and freshly baked cakes at The Coffee Bean in Singapore. Starbucks and Coffee Bean are probably the biggest arch enemies when it comes to Ice Blended and Coffee drinks. In fact, I think The Coffee Bean is better. 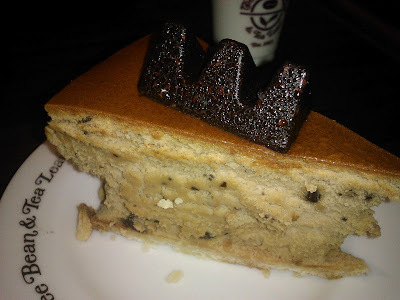 Anyways, today, I'm going to write about all the various cakes I tried out at the various Coffee Bean outlets in Singapore. My favourite outlet has got to be the outlet at Bishan Junction 8. 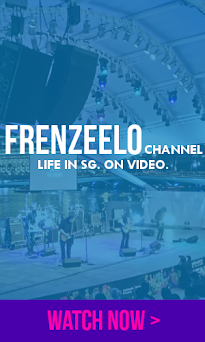 Don't worry if you don't live near Bishan as there's tons of outlets islandwide. The Coffee Bean, if you didn't know, is a coffee company that makes ice blended and coffee drinks along with the usual cakes and desserts. Just like its enemy, Starbucks, The Coffee Bean also originated in the United States. In fact, they claim that they were the first ones who created the ice blended coffee drink. Very interesting indeed. In Singapore, most of the outlets serve some extra items such as puffs, muffins, cookies, pastas, all-day breakfast, sandwiches and much more. Without further ado, let's make your mouth water with the different varieties of cakes and desserts I have tried at the Coffee Bean. A post on beverages will be done on another day. First up, it's the Chicago Cheesecake. I love cheesecake. In fact, it's my favourite kind of cake. 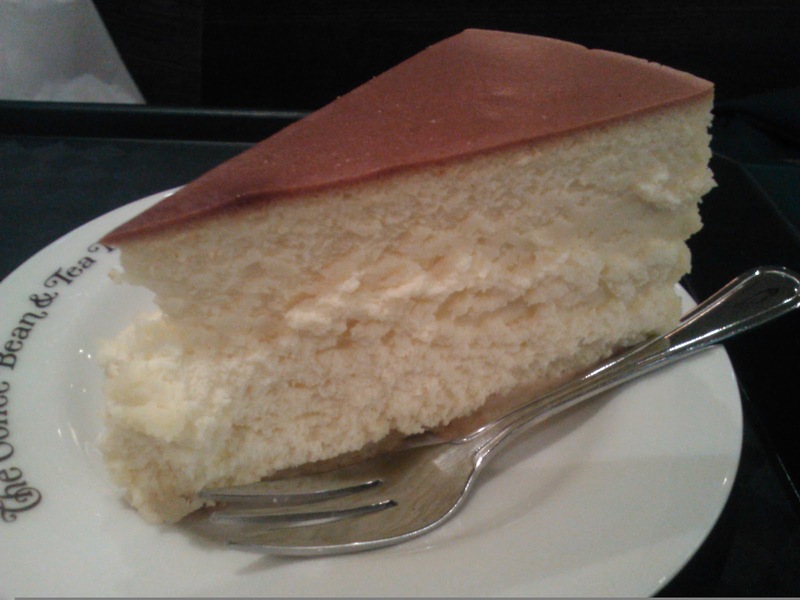 The Coffee Bean has this cheesecake called Chicago Cheesecake which looks like a typical cheesecake, yellow coloured and it tastes just like a typical cheesecake. The cake is soft and you can taste that tangy cream cheese flavour when you take a bite into it. For me, I like my cheesecake hard and soft at the same time. This is definitely a good cheesecake if you're a die hard cheesecake lover like me. The price is around S$6++. Apart from cheesecakes, I also like brownies. 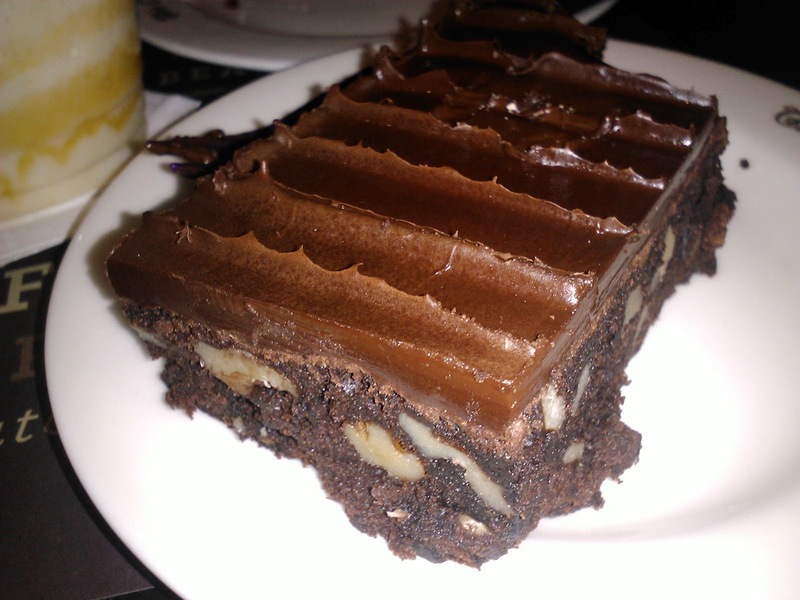 The Boston Nut Brownie is also a nice and delectable dessert at the Coffee Bean. The brownie is soft, chewy, moist and has nuts and every bite will have that chewy and nutty feeling which melts in your mouth. Mmm... so delicious! The brownie also has this nice design on top which kinda looks like they put a big chocolate bar on top and maybe used a knife to make some of the chocolate bar 'stand up'. I love the brownie and it's another Coffee Bean item I highly recommend you to get especially if you're a brownie fan like me. Another delicious cheesecake is this Toblerone Cheesecake. Who doesn't love Toblerone? It's a very famous chocolate bar with a strange triangular shape. There are different varieties of Toblerone which include Milk Chocolate with Nutc, White Chocolate and Dark Chocolate. It's available at major supermarkets in Singapore. I'm not so sure which Toblerone variant they used for this particular Toblerone Cheesecake. Even though this is a cheesecake, it's slightly different than the Chicago Cheesecake I talked about above. The Toblerone Cheesecake is slightly harder and the cream cheese is less tangy. To be honest, I like this version better plus tiny bits of Toblerone Chocolate totally complements the cheesecake. Well, as long as it's delicious, tangy and soft, I highly recommend it for cheesecake lovers. 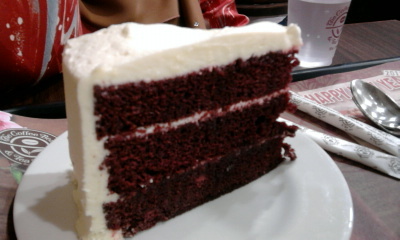 Also available at Coffee Bean is the Red Velvet Cake. Red Velvet Cake is a popular layer cake with vanilla icing or cream cheese icing. It's red in colour because of the red food colouring added into it. 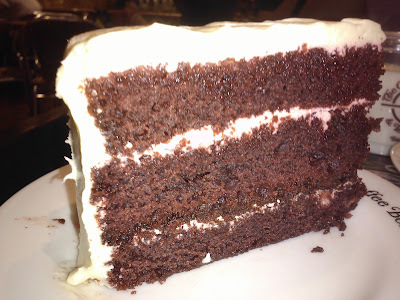 I can't recall if the icing was cream cheese or vanilla on this Coffee Bean Red Velvet Cake but it was like a little bit of both. It's soft, I like the icing and it's moist. 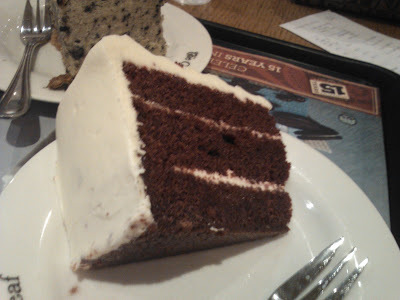 Although at one point, the Red Velvet Cake was actually a bit dry unlike other outlets. I can't really recall which outlet served the dry red velvet cake. Anyway, it seems that I have a few other photos of the red velvet cake because it's a cake me and my sister liked. So, yeah I ate the cake three times, or more. You should get it if you want something a little bit different than your typical cheesecake or your typical chocolate cake. Now I can't really remember what cake is this. I think it was the Blueberry Cheesecake or I think it's the Raspberry cheesecake. 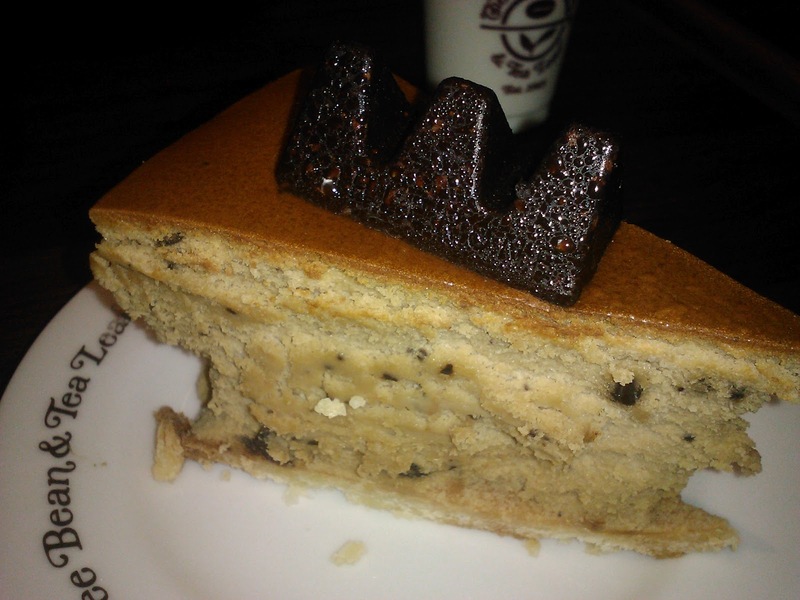 If you see this at a Singapore Coffee Bean, please let me know the name of this cake. Surprisingly, I still remembered the taste. Well, the cheesecake tastes nothing like the Chicago Cheesecake that I mentioned earlier and particularly, this one's a bit fruity and it has a layer of hard and thin chocolate at the top which I think complements each other well. The bottom has this biscuit and it's pretty nice to eat that too. The cheesecake is not that soft and it's comparable to the Toblerone cheesecake. I'm not saying that non-soft cheesecakes are bad but I actually do like all kinds of cheesecakes as long as it has that cream cheese flavour. I like this but I still prefer the Toblerone Cheesecake. Still, it's a great cheesecake. This is the Angel Fruitcake which is only sold around the Christmas season. 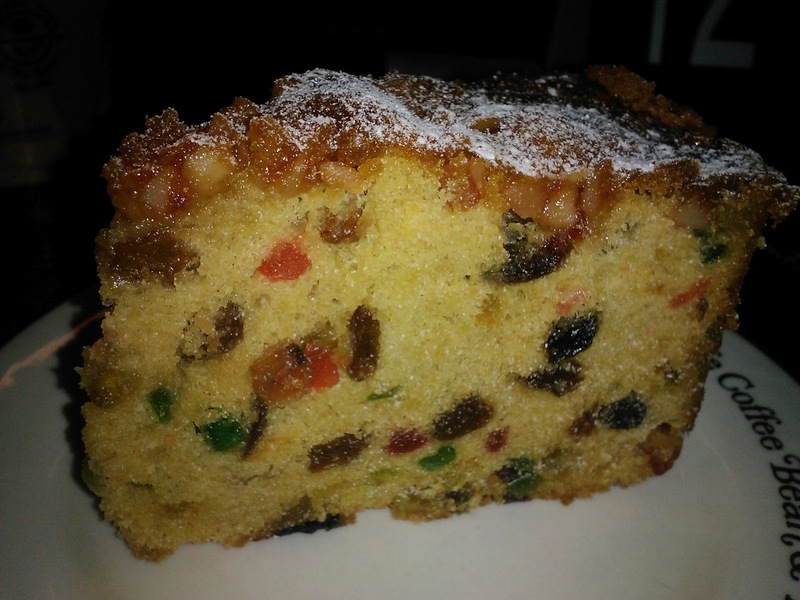 The fruitcake has fruits embedded in it such as raisins, cherries, those green fruit thingies and much more. I don't bother dissecting the fruitcake to see which fruits are in it. It also has this crust on top sprinkled with some powdered sugar which I really like. Overall, the Angel fruitcake is delicious although it's a bit dry and crumbly. 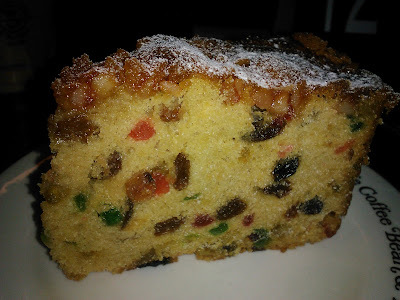 Is a fruitcake really supposed to be dry and crumbly? I don't know but it's certainly worth getting. Unfortunately, you have to wait for the Christmas season if you want to try this lovely cake in which I think is worth the wait. 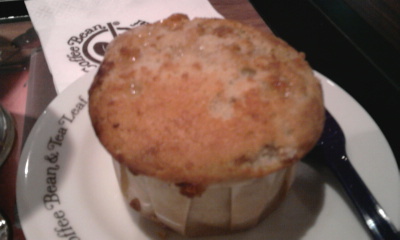 Another kind of cake that I like is muffins! 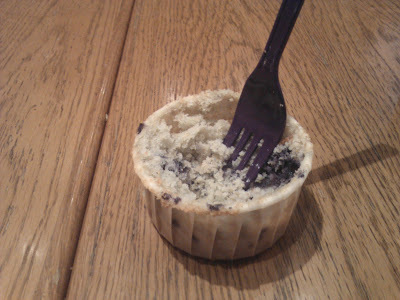 Mmm... muffins are great alternatives to regular cakes. They're miniature, bite-sized and fun to eat. 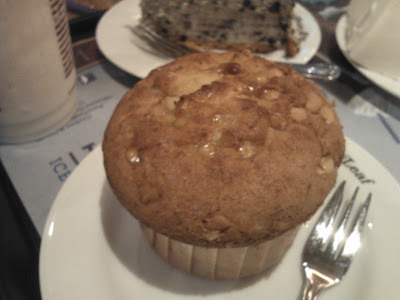 Other than cakes, The Coffee Bean also serves muffins and they have different flavours so it varies by store. The most common muffin "flavour" that they sell is the banana muffin. I love their banana muffins because they're soft (how many times did I mention "they're soft") and has that nice banana flavour. There's also a chocolate chip muffin that they sell and they're pretty much the same as the banana version just that it has chocolate chips in it instead. They're pretty cheap, possibly the cheapest product that they sell, and you can buy it along with a hot drink which totally complements each other. Oh and I just suggested something new for breakfast. A banana muffin and hot coffee. I know you're gonna say "not another cheesecake!". Yes, yes it's another cheesecake. 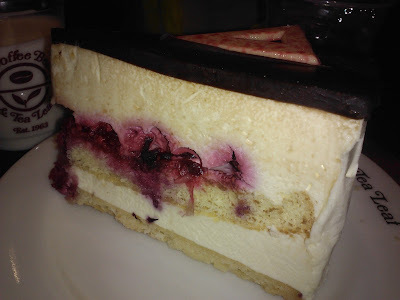 This is probably gonna be my last cheesecake that I'll write about in this post though. 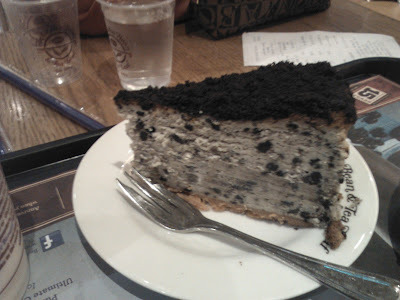 This is the Oreo Cheesecake. Possibly, Singapore's second favourite cheesecake because Oreo cheesecake is also available at almost every cafe I can think of. The Coffee Bean version is pretty standard, not that different than the others although I prefer their Oreo Cheesecake than McCafe's version. Nothing much to say here but I can say that it's delicious and has that Oreo cookie flavour which I really enjoy. This is possibly my third favourite cheesecake flavour. First being my mum's cheesecake, 2nd being the regular cheesecake and third is the Oreo cheesecake. A definite must buy. This cake doesn't look like an average cake. But, it's heavenly. It's called the Mudpie. Essentially, it's a chocolate cake in a weird shape with chocolate sauce on top of it with some sort of sugar beads on top. It's moist, chocolatey, and I like the top of the Mudpie. I don't have anything much to say though. It's a must get if you like chocolate cakes and if you want to have something different than the usual slice. 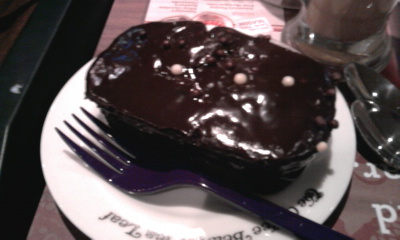 Overall, The Coffee Bean is a great place to get some cakes and desserts. 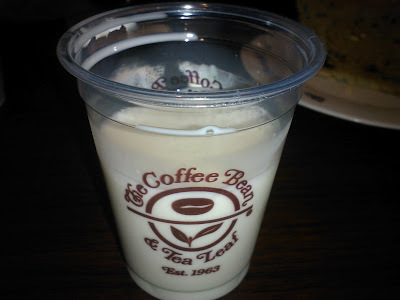 Instead of going to fast food restaurants with your friends, try going to The Coffee Bean for a change. Different outlets will have different varieties of cakes and desserts and it's best to visit one with lots of cakes on display. What's great is that you can even take away if you wanna eat at home or somewhere else. 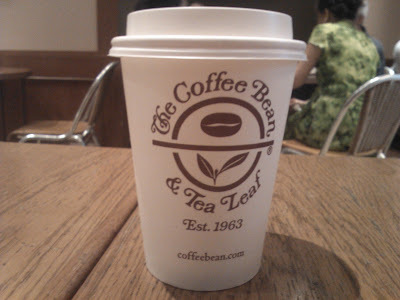 The Coffee Bean also has a nice environment to enjoy your food and the seats are generally comfy. It also has free Wifi so you can bring your laptop and do your work while having some coffee and a piece of cake. With so many outlets located around Singapore, it's easy to get your morning coffee fix or dessert fix without heading so far. The Coffee Bean and Tea Leaf is HALAL certified. Comment Question: What's your favourite cafe and what's your favourite cake?